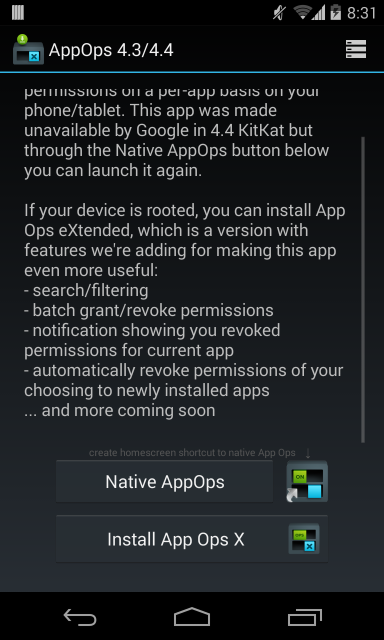 Google removed access to App Ops, the hidden Android app permission manager interface, in Android 4.4.2. App Ops is still present in Android, however — with root access, we can get it back. The cat-and-mouse game with Google’s Android developers continues. We’ll have to continue the battle until Google waves the white flag and admits that we users should be able to control access to our own private data. Root Access: Google has completely disabled access to App Ops for mere mortals, but it’s still available deep in the stock Android ROM as of 4.4.2. With full root access, we can take it back. 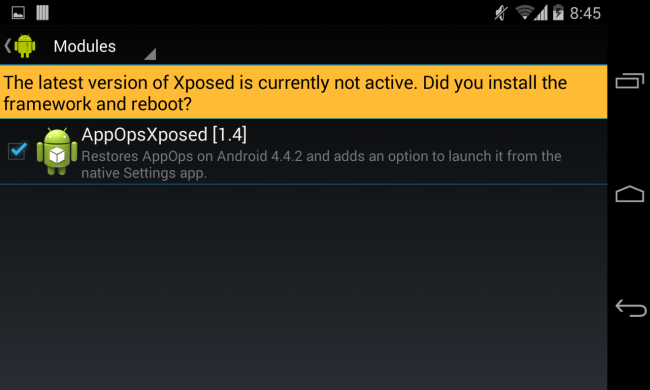 Xposed Framework: The Xposed Framework is a tool that allows us to modify parts of the system that would normally require flashing a ROM. 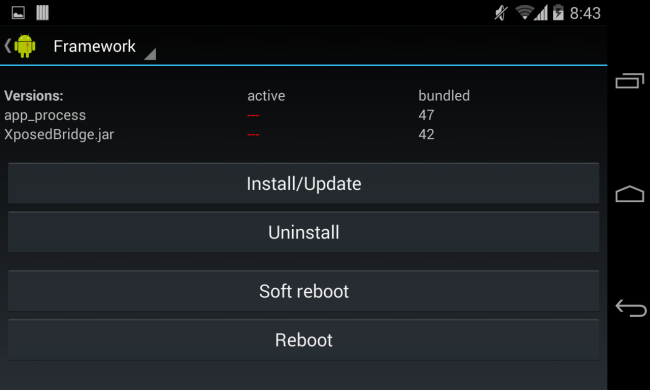 With the Xposed Framework and root access, we can make these sorts of system-level tweaks. These tweaks allow us to modify system apps at runtime without directly modifying their files. AppOpsXposed: This Xposed Framework module restores access to App Ops and adds an App Ops option to Android’s main Settings app. First, you’ll need to root your device. How you do this depends on your device. 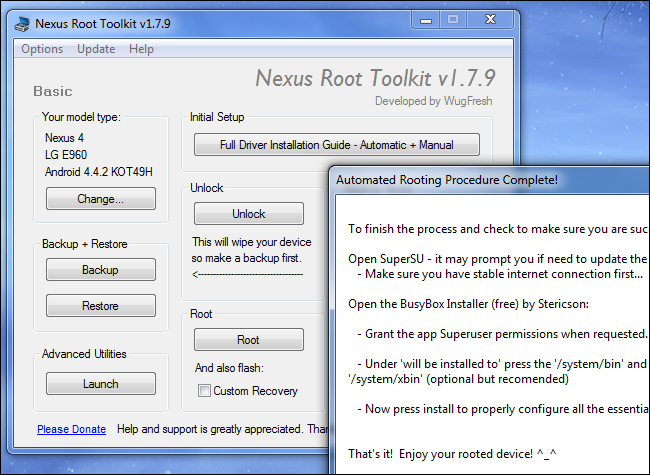 If you have a Nexus device, we like WugFresh’s Nexus Root Toolkit, which will walk you through the entire process. Once rooted, you’ll need to enable the “Unknown Sources” option, download the Xposed framerwork Installer APK file from its official website, and install it on your device. Launch the Xposed Installer after it’s installed, tap the Framework option, and tap Install/Update. With the framework installed, tap Modules in the app to view modules you can download. Scroll down and tap the AppOpsXposed module, then tap the Download button to install it. Enable the module in the Modules list and reboot your device to activate your tweaks. 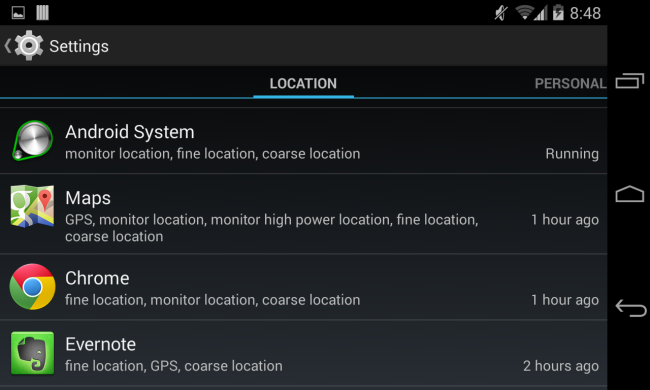 You’ll see an App Ops option in Android’s Settings app, where it belongs. Tap the app to access the now-unhidden App Ops interface. If you already have root access, you can still use the paid App Ops X. App Ops X is an “eXtended” and recompiled version of Google’s App Ops tool with additional features. Once you pay for an in-app purchase, the installer app downloads App Ops X and uses its root access to install it to your system partition. App Ops X is noteworthy because it continues to function normally on Android 4.4.2, even after Google broke the standard version of App Ops. If Google were to entirely remove the included version of App Ops on a newer version of Android released after 4.4.2, it’s possible that App Ops X would still continue to function and would become the best option. If nothing else, this shows a path forward if Google were to remove App Ops entirely. Developers could recompile the App Ops interface and use root access to install it to the system partition. Google says that App Ops just exposes system APIs that are being used elsewhere in the system — for example, to restrict notification permissions or control which SMS app has the ability to send SMS messages. Thus, Google wouldn’t be able to stop us from doing this without removing access to the lower-level APIs themselves, even if they removed the interface entirely. Rather than start playing a cat-and-mouse game with Google’s Android developers, who may start attempting to break the App Ops interface and disable even these tricks in future versions of Android, you may just want to install a custom ROM. For example, CyanogenMod includes its own permission manger that’s now based on App Ops. Cyanogenmod’s developers likely won’t remove access to App Ops in a minor update. Even before App Ops existed, Cyanogenmod incorporated its own app permission manager that allowed users to control what apps could and couldn’t do on their own devices. Part of the beauty of Android is that it allows such custom ROMs to exist, so you can choose to step away from Google and choose to trust other developers. Part of the ugliness of Android is that you so frequently have to, whether you’re looking for app permissions management or just timely updates for many Android phones. Rather than forcing users who care about managing app permissions to root their devices and modify system files — or install a new Android operating system entirely — Google should allow all users to control access to their private data. Android users should be able to control whether an app can access their contacts or not, just as iOS users can.